This week the BLM issues fire restrictions for parts of Los Angeles, San Bernardino, Riverside, and San Diego counties banning campfires, except in developed campgrounds. Back country campfires are always illegal in Cleveland National Forest, San Bernardino National Forest, San Jacinto State Park Wilderness, and Angeles National Forest. This means campfires are banned along most of the Pacific Crest Trail south of Hwy 138 [PCT mile 518]. Cleveland National Forest – Wood or charcoal fires are allowed only in developed campgrounds and developed picnics areas within designated fire rings. Gas, liquid, and jelly petroleum fueled stoves are allowed in developed campgrounds, developed picnic areas, and other areas with a proper permit. Anza Borrego State Park – Ground fires are not permitted. A metal container must be used for all campfires. Bring your own firewood. Gathering or taking of any live, dead or downed vegetation is prohibited. Pack out all ashes. 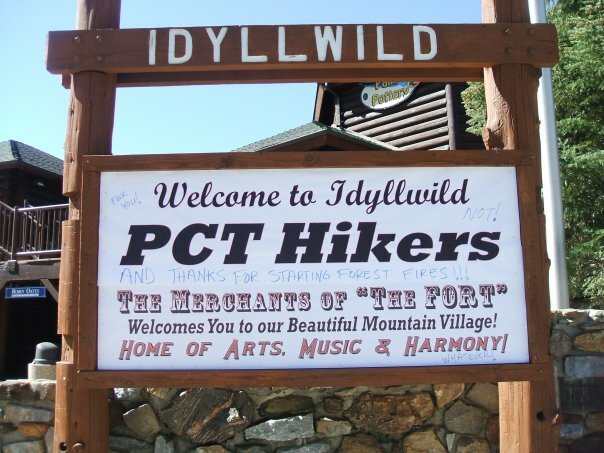 A sign welcoming PCT hikers to Idyllwild is defaced after the 2008 Apache fire that was started by a hiker smoking on the PCT. San Bernardino National Forest – Wood and charcoal fires are not permitted [outside of developed campgrounds]. Gas and propane stoves only. Wood fires not permitted in the PCT Camps [Bench Camp, Deer Springs, Doble, Holcomb, Little Bear Springs, Mission Springs]. San Jacinto State Park Wilderness – BUILD NO FIRES. Chemical stoves permitted. Angeles National Forest – Wood and charcoal fires in designated sites only, in agency-provided campfire rings. Gas and petroleum jelly stoves only outside of designated sites with a valid California Campfire Permit. Sequoia National Forest – In areas where campfires are allowed, you will need a valid Campfire Permit during the fire season. During Fire Season, fire and stove use may be restricted. It is your responsibility to check on the current regulations at any Forest Service office or National Park office. – No campfires within the John Muir Wilderness above 10,400 ft. in elevation, south of Piute Pass. – No campfires within the Ansel Adams and John Muir Wilderness Areas above 10,000 ft. in elevation, north of Piute Pass. – Campfires prohibited in a number of additional lower elevation areas where firewood is depleted [this includes parts of the Kearsarge Pass Trail, Tully Hole, Fish Creek area, Purple Lake, Thousand Island Lake, and Rush Creek area]. – Persons with a valid Wilderness Permit or California Campfire Permit are not exempt from the prohibitions but are allowed to use portable stoves or lanterns using gas, jellied petroleum, or pressurized liquid fuel in areas where restrictions are in affect. – Campfires not permitted above 10,400 feet in the Kern River drainage. – No campfires are allowed within 1/4 mile of the food storage locker at Crabtree Meadow on the Pacific Crest Trail. Campfires not permitted above 10,000 feet. Yosemite National Park – Wood fires are allowed in existing fire rings only, and prohibited above 9,600 feet in elevation…Use dead and down wood only. NOTE: You must have a California Campfire Permit to use a stove, lantern, or campfire outside a developed campground or recreation area in California.